Private & tranquil, the Locanda Le Piazze Boutique Hotel is perfectly situated between the small town of Castellina in Chianti and the amazing city of Siena. Well maintained gardens, discrete private corners, and an adult only environment make this your ideal choice for a romantic vacation in Tuscany. The cozy hotel atmosphere promises that you will enjoy the amazing Chianti Classico scenery as well as the many onsite services including the savory menu from The Tavola restaurant or a delicious cocktail from the poolside bar. Only minutes from the enchanting Chianti town of Castellina, you will find yourself surrounded by the classical vineyards & olive groves of the area. 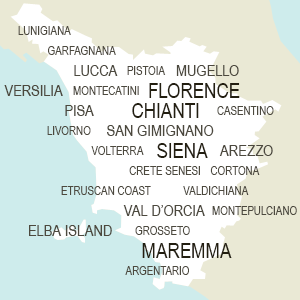 It is easy to plan an adventure to visit the sites, Siena, Florence, and Arezzo are all easy day trips. In the picturesque Chianti countryside, Locanda Le Piazze features an intimate and cozy accommodation for the holidays in Tuscany. The owners tastefully combined a unique and elegant decor with modern comforts to create a relaxing atmosphere for adults in a beautifully restored Tuscan farmhouse. This accommodation is especially suited for guests searching for the tranquility of a well-deserved vacation. There are four styles of holiday accommodations, each designed to offer a pleasing a comfortable experience while in Chianti. Each style is decorated individually with a mix of antiques and contemporary furniture creating an inviting atmosphere. The rooms all boast classical views, some towards the gardens, courtyards, or the hilly countryside of vineyards and olive groves. Besides the WiFi access, the rooms are furnished with many special touches, including a ceiling fan, flat screen television (with international channels), hairdryer, magnifying full-length mirror, personal safe and mini-bar. Not only does Locanda Le Piazze specialize in offering a typical Tuscan vacation but they have a restaurant for guests and visitors. Savor the delicious menu created especially for the guests, including specialties from the area and local recipes with a bit of a modern twist. The award-winning chef is also available to cater events, weddings, and parties on the property. The central location in Tuscany, the romantic decor and gardens and the top quality chef make Locanda Le Piazze a special venue for destination weddings, special celebrations or work-related events. The staff at the Locanda are experienced and provide the perfect assistance for making dreams come true. If your dream is to experience the beauty of Chianti, the vineyards, olive groves, and marvelous sunsets then the Locanda Le Piazze is the perfect destination. The outdoor terraces, well-maintained gardens, and panoramic pool area provide the perfect backdrop to a romantic and relaxing holiday for two. Situated only a short distance from the heart of Chianti, the small medieval town of Castellina, guests can enjoy the local vineyards for wine tasting, the town markets, and the historic sites. Nestled in the countryside between Florence and Siena, the boutique hotel lends itself to day trips exploring the beauty of the area. Plan an adventure into the Val d’Orcia or schedule a day at the wine cellar of Montepulciano and Vino Nobile. Walk the streets of Arezzo or take time to enjoy the peace and quiet in the Cortona landscape.